Business jet aircraft (also known as "biz-jets") typically carry 5-15 passengers and are primarily used as transportation by business executives and government officials. In the early days of flight, before World War I, aircraft were constructed entirely of wood and canvas. They were shaped and joined by skilled craftsmen, many of whom were drawn from other woodworking trades. Every aircraft was unique, reflecting many different thoughts and constant design changes. The beginning of World War I brought a sudden demand for thousands of aircraft. This meant that factories had to accommodate large-scale manufacture and assembly of aircraft components by unskilled workers. Small companies grew into major manufacturers capable of producing many different types of aircraft in large numbers. 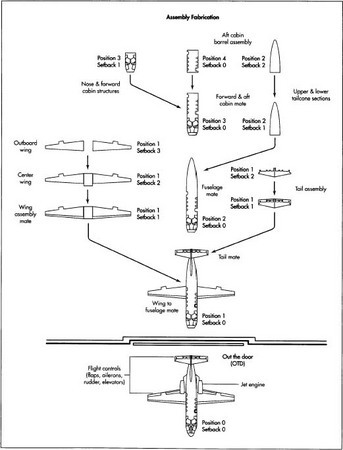 The techniques for building aircraft evolved gradually during the years between the wars. Wood and canvas changed to aluminum as the principal structural material while designs improved and records were set and broken. Monoplanes (single wing aircraft) were becoming more popular than biplanes (two wing aircraft). More power-ful and reliable aircraft engines were continually being developed to increase pay-loads and ranges. Because of the increased reliability and improved comfort, aircraft became a more acceptable form of freight and passenger transport. The aircraft industry had to gear up once again for the mass production of aircraft with the approach of World War II. A great many more aircraft were produced than during World War I by the leading powers, the U.S., Britain, Italy, Germany, and Japan. The aircraft industry had spread worldwide, and changed dramatically during the five years of conflict. Piston aircraft engines became larger and more complex and were produced in large quantities, while the jet engine was also being developed and tested. The development of radar and other sophisticated electronics had also taken place, eventually forming the large avionics (aeronautical electronic equipment) industries of today. The corporate jet aircraft industry had its beginnings in the mid-1950s with the introduction of Rockwell's Sabreliner and Lock-heed's JetStar models. LearJet entered the business jet market in the early 1960s with its Model 23, and was followed by Cessna in the late 1960s with its Citation 500 model. Today there are at least eight different U.S. and international aircraft companies marketing business jets. The principal material used in modern air-craft manufacturing is aluminum sheet, billet, and castings, but the use of composite materials is rapidly increasing. Composite materials are structural materials made up of two or more contrasting components, normally fine fibers or whiskers in a bonding resin. Composites such as carbon epoxies, graphite, fiberglass, carbon fiber reinforced plastics (CFRP), boron fiber reinforced plastics (BFRP), and glass reinforced plastics (GRP) enable manufacturers to build aircraft that are lighter and stronger than aluminum models. Steel alloys, titanium, stainless steel, and magnesium castings are also used, but in much smaller quantities. There are six major subassemblies which make up an aircraft: 1) the fuselage or body, 2) the empennage or tail assembly, 3) the wings, 4) the landing gear assemblies, 5) the powerplant or jet engine, and 6) the flight control systems and instruments. Just as in automotive manufacturing, the aircraft industry uses assembly lines for manufacturing. The production volume is much lower in aircraft, but the idea is the same. In aircraft manufacturing, a series of "positions" and "setbacks" are used to indicate the stage of the aircraft assembly. For example, if 16 positions are used to manufacture an aircraft, the 16th position would be the beginning of assembly, starting with either the nose section or wing spar buildups, and the 1st position would entail the installation of the engines and nacelle assemblies (the "nacelle" is the streamlined body which houses the engine). Position 0 indicates that the plane is "out the door" (OTD) and ready for pre-flight inspection and flight test. "Setbacks" indicate the stage a subassembly or "buildup" is within a position. For example, a wing assembly may only encompass one position, but within this position there may be three setbacks. Regardless of position or setback, assembly work is constantly ongoing. Even though one position may have more priority than others, other positions are simultaneously assembled so that both assemblies will be ready for mating at the proper time. The painting and work on the interior of the aircraft—adding seats and cabinets, for example—are done last as they can vary from aircraft to aircraft. The production of an aircraft relies on the precise and accurate alignment and mating of each one of the major subassemblies. For subassembly production and assembly mating, a series of floor assembly jigs (FAJs) are used. These jigs hold, support, and locate the individual workpieces or subassemblies until they can be riveted, bonded, or bolted in place. Rigidity of the assembly jigs is critical to prevent misalignment, so most of these tools are large and heavy. Some of the jigs are permanently installed, while others are on rollers so they can be moved to the assembly line when needed. The fuselage group is the first main assembly to be produced. The fuselage group consists of the nose structure assembly, forward cabin structure assembly, aft cabin structure assembly, and the tailcone assembly. The aircraft is essentially assembled from the back forward. 1 The first part of the fuselage to be assembled is the aft cabin barrel assembly (see illustration marked "Position 4, Setback 0"). The cabin barrel is assembled in the vertical direction in a floor assembly jig. The cabin barrel jig incorporates all the frame assemblies, skins, and supporting structures necessary to complete the aft cabin barrel assembly. Details and sub-assemblies are provided with tooling holes and locators set to contour templates which define the aircraft's loft or contour. Next, an aft cabin intermediate jig is used to assemble three primary components: the aft cabin barrel, the aft pressure bulkhead (which serves as the boundary of the pressurized section of the fuselage), and the wing attach fittings. 2 The nose and forward cabin structures are assembled next (see "Position 3, Setback 1"). The nose section jig assembles the forward frame wheelwell assembly, skin assemblies, and supporting structures. The forward cabin buildup jig assembles the windshield frame, cabin door frame, forward pressure bulkhead, supporting structure, and skins. 3 The forward and aft cabin sections are now mated using a cabin mate jig. Both cabin sections are located in the jig through the use of tooling holes which coordinate both the forward and aft pressure bulkheads (see "Position 3, Setback 0"). are also being assembled. The tail-cone mate jig is used to connect and align the upper and lower tailcone subassemblies (see "Position 2, Setback 2" and "Position 2, Setback 1"). 5 The three primary fuselage sections, nose, forward and aft cabin assemnbly, and tailcone are located and assembled using a fuselage mate jig. The forward and aft cabin sections are loaded into the jig first, followed by the nose and tailcone sections. Engine mount brackets, forward and aft, are now installed onto the structural engine beams which extend out from the fuselage. Mounting holes are also aligned. These will be used to attach the vertical stabilizer to the tailcone and the aft canted bulkhead (the aft canted bulkhead "caps" off the end of the tailcone section). (See "Position 2, Setback 0"). The empennage or tail assembly is the next section to be assembled. It consists of the vertical fin, rudder, horizontal stabilizer, and elevators. The rudder is the primary control surface for yaw or side to side movement usually used to turn the aircraft. Two elevators are mounted on the trailing edge of the horizontal stabilizer and are used to control the pitch or up and down motion of the air-craft. 1 The horizontal stabilizer frame buildup jig is used to assemble the leading edge and spar assemblies, along with the vertical attach fittings, stringers (aluminum extrusions which are used to provide structural support for sheet metal skins), skins, and supporting structures (see "Position 1, Setback 2"). 2 Elevator frame buildup, trim tab assembly, and skinning jigs are used to assemble the right and left hand elevators. The trim tabs are movable control surfaces attached on the trailing edge of the elevators, used to hold the aircraft in level flight during cruise conditions (somewhat analogous to cruise control in a car). After the elevator frame and trim tabs are constructed, the skinning jig is then used to assemble the frame and trim tab assemblies along with the tip, leading, and trailing edge skins. 3 The vertical fin buildup jig is used to assemble the leading edge, spar, and bonded skin assemblies, along with the horizontal attach side plates and the supporting structure required to complete the vertical fin section. The fastener locations in the tailcone are established by the airframe alignment jig to ensure the vertical fin's relationship to the wing and engine attach points. 4 Rudder frame buildup, trim tab assembly, and skinning jigs are utilized in assembling the rudder assembly. After the rudder frame and trim tab is completed, the skinning jig is then used to assemble the frame and trim tab assemblies, along with the leading and trailing edge skins. 5 The empennage section of the aircraft is completed after the elevators, horizontal stabilizer, vertical stabilizer, and rudder are assembled (the rudder is usually installed last along with the flight control systems). (See "Position 1, Setback 1"). The empennage section is then mated to the aircraft tailcone section (see "Position 1, Setback 0"). The wing assembly is next and typically consists of the center wing section, outboard wing sections, and aileron and flap assemblies. The ailerons are movable control surfaces, usually hinged to the outer wing, which help provide control in roll about the longitudinal axis of the plane. The flaps are movable control surfaces, mounted inboard on the wing, which are able to hinge down-ward. These increase low-speed lift and add drag, allowing the aircraft to make steep approach landings without gaining excess airspeed. 1 Aileron frame buildup and skin and rivet jigs are used to assemble the left and right hand aileron assemblies. After the aileron frame is completed, the skin and rivet jig is used to load the aileron frame, skin and doublers (used for extra strength), then rivet the assembly complete. The aileron frame is located by pinning the hinge bearings and the inboard and out-board rib webs (the ribs are primary structural members running across the aileron). The ailerons are usually installed last, along with the flight control instruments and flaps. 2 Flap frame buildup and skin jigs are used in constructing the left and right hand flap assemblies. The flap frame is completed first. Then the flap skin jig assembles the bonded upper skin and trailing edge skin, flap spar section, leading edge assembly and end ribs and interconnect clevises. 3 The building of the outboard wing section involves the use of many different jigs for drilling, riveting, and buildup. The main tool used is the outboard wing buildup jig, which assembles the forward outboard wing assembly, rear spar assembly, trailing edge bonded skin assemblies, and the supporting structure (see "Position 1, Setback 3"). 4 The construction of the center wing section also requires the use of many different buildup jigs. The primary tool used here is the center wing buildup jig, which assembles the center section subassembly, wheelwell structure, rib and skin assemblies, and the supporting structure (see "Position 1, Setback 2"). 5 The wing assembly mate jig assembles both the left and right outboard wings with the center wing. The wing sections and center section are located in the jig by locators and contour boards. The center section is loaded first, followed by the left and right outboard wings (see "Position 1, Setback 1"). The completed wing assembly is then mated to the fuselage section (see "Position 1, Setback 0"). There are two different landing gear assemblies: the nose and main landing gears. Both use retraction systems which are electrically controlled and hydraulically actuated. The main landing gear (MLG) is usually a trailing link type, and retracts inboard into the wing. The nose landing gear (NLG) retracts forward into the fuselage nose section, and is enclosed by doors. The landing gears are assembled away from the main assembly line and are brought to the line when needed, usually when the fuselage and wings are being mated (see "Position 1, Setback 0"). A business jet is typically powered by two turbofan jet engines located on each side of the rear fuselage in nacelle assemblies. The nacelle assemblies consist of an inlet section, a cowl or outer housing, an exhaust nozzle section, and a bleed air system, which diverts hot air to the wing and nacelle leading edges for deicing. Bleed air is also used for cabin heating and pressurization. The large sheet metal panels which form the cowl are typically roll formed. Some of the other sheet metal parts, such as the nose cap on the nacelle inlet section, are formed using a female die in a draw press. Nacelle assemblies are built separately away from the line and then brought back for installation (see "Position 1, Setback 0"). The flight control systems are usually installed last, along with the ailerons, flaps, and rudder. There are many different flight control systems which go into a modern air-craft. The following is a partial list of the major systems: aileron control system; aileron trim system; speedbrake system; flap interconnect system; rudder control system; rudder trim control system; elevator control system; elevator trim control system; pressurization system; windshield anti-ice system; wing anti-ice system; oxygen system; pitot static system. (See "Position 1, Setback 0"). Before the aircraft leaves the factory, all electrical and mechanical systems undergo a functional test. Examples of items checked are fuel calibration, hydraulic systems, gear blow down and lock, warning lights and horns, and avionics. After the engines and flight control systems are installed, the aircraft is ready to go out the door for engine testing and flight test. The aircraft is put through numerous performance and systems tests before it is approved for delivery to the customer. Before delivery, the aircraft is sent to be painted, after which the interior is finished. (See "Position 0, Setback 0"). The quality of aircraft depends on good design, documentation, and electronic record keeping to meet Federal Aviation Administration (FAA) regulations and certification requirements. The windshields, wing leading edges, engines and other critical components must meet the FAR 25 (Federal Aviation Regulation) bird strike requirements before the aircraft is certified for commercial use. Many different forms and checklists are used throughout the manufacturing process to detail the history of each part made. Various laboratory tests and standardized aerospace material specifications have been developed specially for aircraft. To check how well bonded panels have adhered, they are placed in a water tank for ultrasonic testing. Stress testing is used extensively. A section of the aircraft is assembled and then placed in a test fixture which simulates actual use under varying conditions. Some of the tests are run until the parts fail, to see if the design safety factor is acceptable. Environmental protection laws have developed stringent codes limiting water flows and emissions from aircraft manufacturing facilities. In compliance with federal laws, aircraft companies have been using fewer solvents and looking for better ways to clean parts, such as steam vapor degreasing systems. Aluminum chips and scrap material are the major byproducts of the aircraft industry, and are recycled. Technological change is a major driving force in the evolution of aircraft manufacturing. Many developments underway involve computerized controls and automation designed to improve economy and quality and lower energy consumption and pollution. More assembly operations, such as riveting, may become completely automated. "Smart" sensors—sensors with predictive abilities involving fuzzy logic and artificial intelligence—are becoming more prevalent. Artificial intelligence or "fuzzy controls" enable the sensors to predict changes needed in the settings due to changes in load or production volume. In addition to these developments, increasing economic and environmental needs will bring further technical refinements to aircraft manufacturing. Bright, Charles D. The Jet Makers. The Regents Press of Kansas, 1978. Gunston, Bill. Jane's Aerospace Dictionary, 3rd edition. Jane's Information Group Ltd, 1988. Phillips, Almarin, A. Paul Phillips, Thomas R. Phillips. Biz Jets: Technology and Market Structure in the Corporate Jet Aircraft Industry. Kluwer Academic Publishers, 1994. Porter, Donald J. The Cessna Citations. TAB Books, 1993. Rowe, Frank Joseph and Craig Miner. Borne on the South Wind: A Century of Aviation in Kansas. The Wichita Eagle and Beacon Publishing Co., 1994. Todd, Daniel. The World Aircraft Industry. Auburn House Publishing Company, 1986. Winant, John H. Keep Business Flying: A History of the National Business Aircraft Association, Inc. 1946-1986. The National Business Aircraft Association, Inc., 1989.